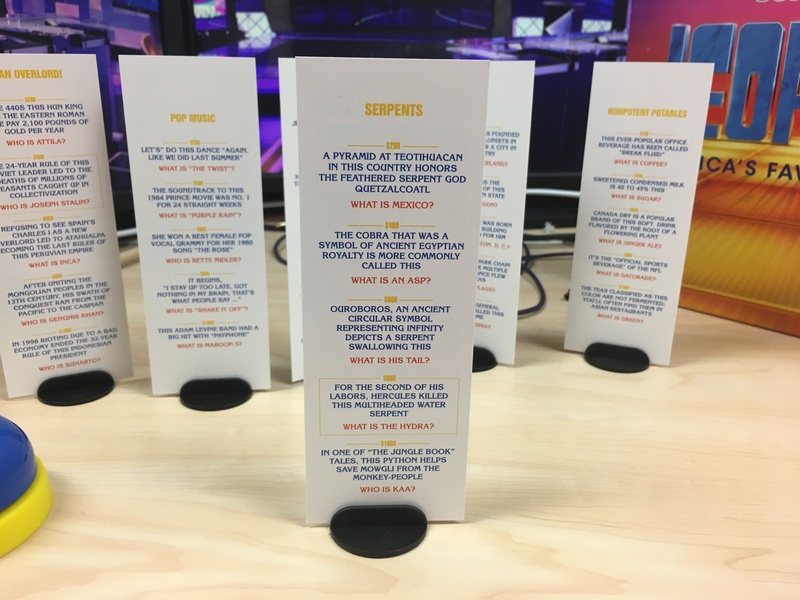 Outset Media’s released a new Jeopardy! board game. We review it, and give you a chance to win a copy! It’s been a few years since a nice, proper Jeopardy! board game was released. Most of the Jeopardy! home game efforts have been plagued with inaccurate gameplay or board elements. (For the longest time, every Jeopardy! board game had 5 categories instead of 6.) In my opinion, the best Jeopardy! board game was the version that Tyco released in the early 90s. 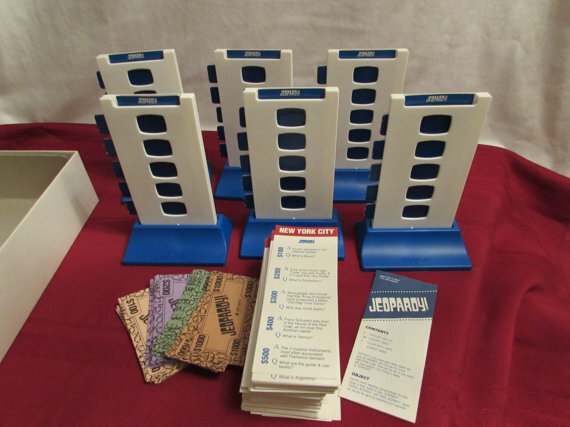 Instead of playing a sheet of categories in one plastic board, there were 6 freestanding plastic towers that held all the clues. Cardboard sliders hid values that were unavailable to play, giving the game a real TV-like feel. And with separate category cards instead of one giant sheet of answers and questions, the game could be tailored to whoever’s playing. 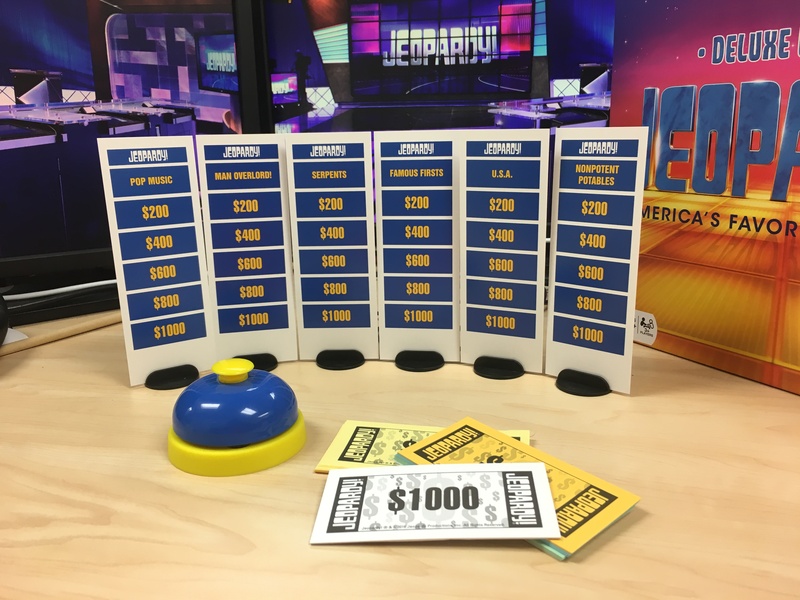 Now, in 2016, Canadian manufacturer Outset Media Games has secured the rights to the Jeopardy! brand for a line of new board games. ￼They’ve got 3 different versions of the game. The base game contains 180 Jeopardy! category cards, 6 stands for each card, and fake Jeopardy! cash (and no, Trebek’s face isn’t on the money). The Deluxe edition has 72 extra cards and a metal bell to use to ring in. The buzzer bell is metal and functions like a hotel desk bell, and it’s a pleasant blue and yellow. The travel edition is just 108 cards, without cash and stands. Outset recommends buying the Travel version as an expansion pack for the Deluxe edition. The rules inside closely follow the Jeopardy! game show, adapted of the limitations of playing a game at home where you don’t have buzzer systems, a giant computer system keeping score, 36 TV monitors, or the crushing realization you paid more than $40 for a game show board game. Some clues have a yellow border, signifying that clue’s a Daily Double. The rules state that when choosing categories, only choose one category with a yellow border per 6 categories. (For Double Jeopardy!, use 2.) It, along with the individual cards and card stands, are solutions reminiscent of the great Tyco game of the early 90s. The Final Jeopardy! deck has very apropos Final Jeopardy! clues, those thinkers that usually can be worked out with a good 30 seconds of thought. 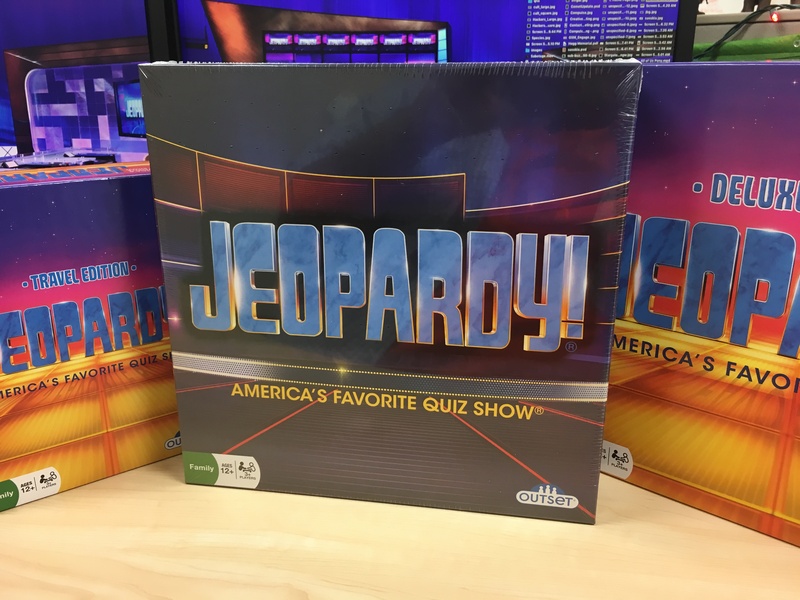 What’s interesting is that with the amount of cards in the Deluxe Edition box, there’s 18 full games of Jeopardy, but there are 36 Final Jeopardy! cards. Purists of the show will lament the singular buzzer (or no buzzers at all, in the case of the base edition) and lack of paper and pencils or whiteboards for Final Jeopardy!. When I play tested the game with some colleagues, we stopped the flow of questioning more than once to ask what clues were already asked, seeing as there’s no way out of the box to indicate if a clue was already answered (making the Forrest Bounce pretty difficult to keep track of). Some of the minor rule choices (for instance, the rules state that players can’t go into debt while playing, but that’s a consequence of playing with paper money; also, there’s no stipulations for ringing in before the host is finished reading the clue) may annoy some. But the positives (lots of material, accurate gameplay, easy to cater to everyone playing) outweigh the negatives. If you DO get the Jeopardy! 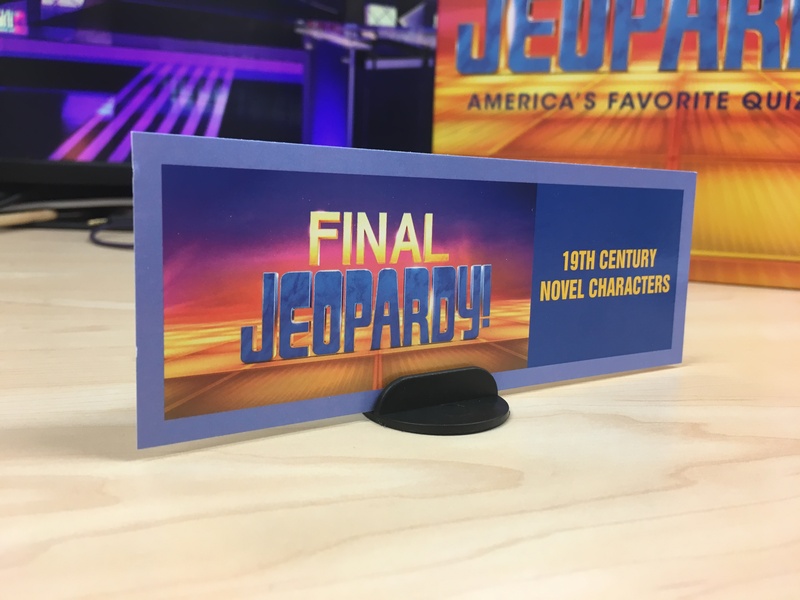 board game (and I suggest you do, it’s fresh content, it supports the show, maybe they’ll make more), I’d suggest some small dry erase boards for Final Jeopardy! and maybe even a stupid calculator app I made for even more fun. Pick the game up now at your local retailer. I’ve seen them online at Kmart and Amazon. Hey! Do you want your own copy of the game? Enter our giveaway! Click this link and enter today!